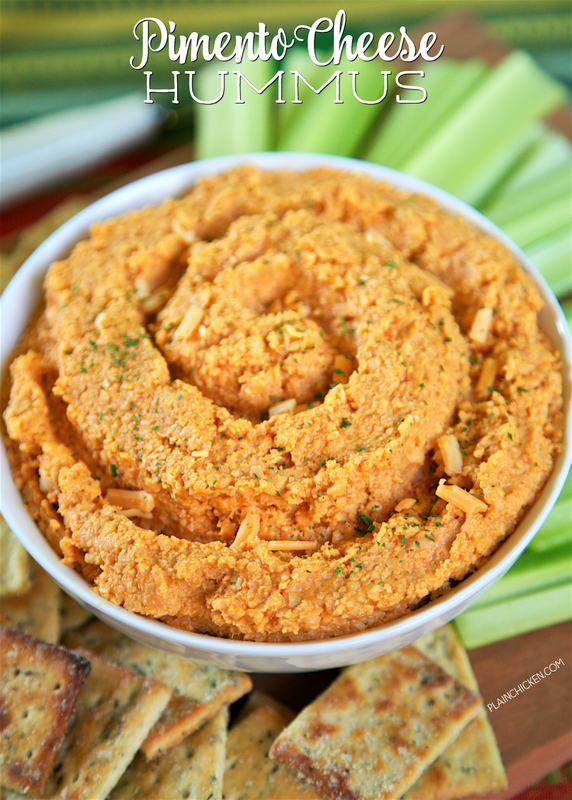 3-Ingredient Pimento Cheese Hummus - Bush's Garbanzo beans, Bush's Roasted Red Pepper Hummus Made Easy and cheddar cheese. Ridiculously easy and crazy delicious! Ready in about a minute! Whip this up when you need a last minute snack. Great for parties and tailgates!! Do you need a quick and easy appetizer or snack? 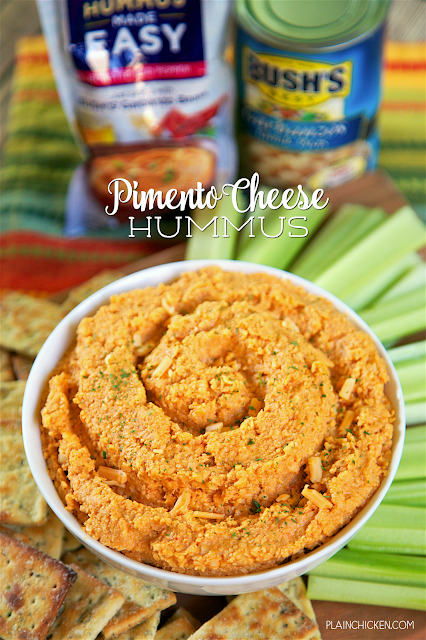 Well, this Pimento Cheese Hummus has 3 ingredients and is ready in less than 5 minutes! Woo hoo! This would be great at a summer cookout, dinner party and tailgates! I already know I will be bringing this to at least one tailgate this fall. We served the hummus with some celery sticks and crackers. It was a huge hit in our house! 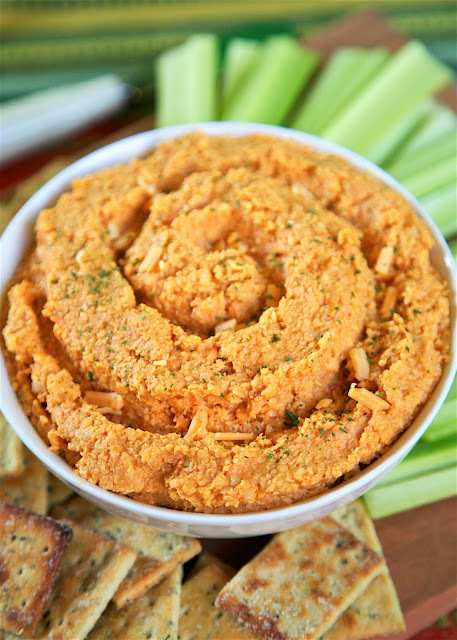 As I said, there are only 3 ingredients in this Pimento Cheese Hummus: Garbanzo beans, cheddar cheese and a package of the new BUSH’S® Roasted Red Pepper Hummus Made Easy. 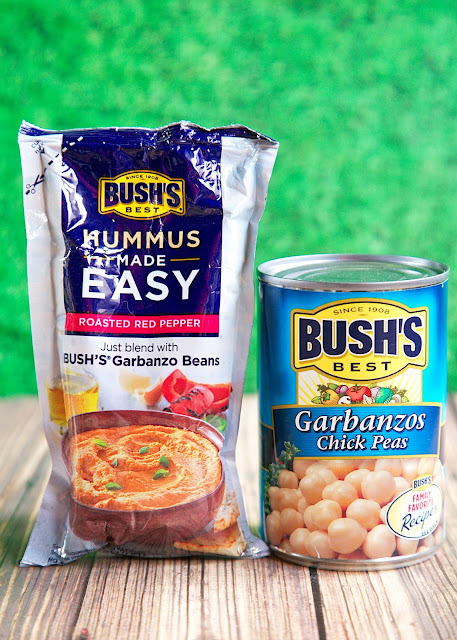 We are LOVING BUSH’S® Hummus Made Easy pouches. They are located right next to the BUSH’S® Beans at the grocery store. I absolutely love how easy it is to customize hummus to our taste. We made a Southwestern Hummus Dip a few months ago and loved it. I couldn’t wait to try a different flavor. 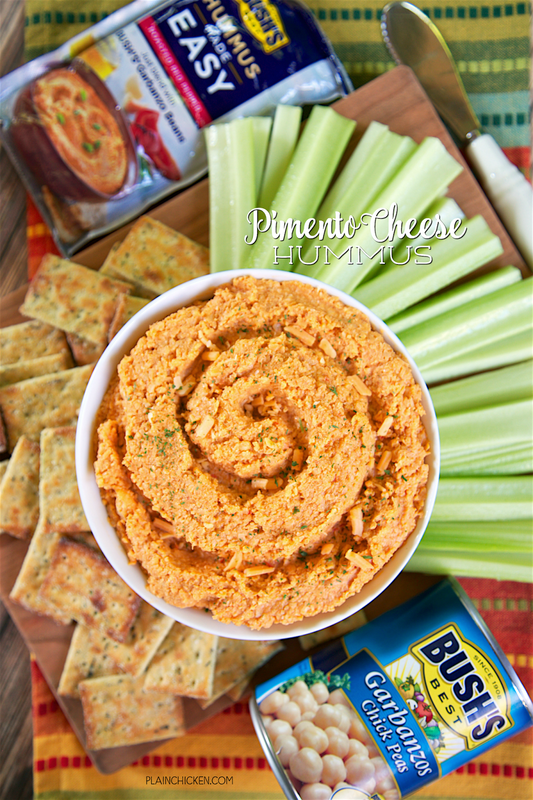 I often use chopped roasted red peppers in my pimento cheese recipe, so I immediately knew I needed to try the BUSH’S® Roasted Red Pepper Hummus Made Easy to make hummus pimento cheese. This Pimento Cheese Hummus couldn’t be any easier to make. Simply drain and rinse the beans, add the beans, BUSH’S® Roasted Red Pepper Hummus Made Easy pouch and cheese to the food processor and pulse until it reaches the desired consistency. It literally took about 2 minutes from start to finish. We love to have this for an afternoon snack. There is one more variety of BUSH’S® Hummus Made Easy that I haven’t tried yet - the Classic Hummus Made Easy pouch. I will be giving it a try very soon - stay tuned!! Combine the BUSH'S Garbanzo beans, BUSH'S Roasted Red Pepper Hummus Made Easy and shredded cheese in the food processor. Blend until desired consistency. My favorite is spinach and artichoke hummus. I like the Classic Hummus with no spices. I love feta cheese and avocado hummus. I love roasted garlic hummus! I like my hummus with red pepper and jalapenos. Tuscan hummus from Trader Joes is my favorite! My favorite hummus is Sabra's Red Pepper flavor. I love to dip vegetables and pita chips in hummus! I posted a tweet: https://twitter.com/FireRunner2379/status/762448291153842176. I like my hummus with lots of lemon and garlic! Although I love hummus of all kinds, my favorite is still the classic: Garbanzos, olive oil, garlic, lemon juice, and tahini. Simple but delicious. My favorite hummus flavor is roasted red pepper. I love roasted Red Pepper Hummus! I've never tried any other varieties. My favorite hummus is roaasted garlic. I have never tried Hummus before but would like to. i love roasted garlic hummus! but lets be real, any type of hummus is delicious! I make a white bean hummus with garlic, lemon, parsley and cayenne that everyone in my family likes.